How to Create Video for Business – Get Started Today! Now everybody knows the richest media out there is video. Every single social media network is going all in on video. Facebook have done this. Instagram are still doing it. LinkedIn have done this more aggressively in the last year but video is where it’s at. Hence, me being in front of the camera right now but what do businesses get wrong and why are businesses so afraid of video as an idea and as a tactic for marketing and as a way of branding themselves as well? In this video, I’m going to break down what’s wrong with how businesses are using video and what they can do to make their video content resonate better. Coming up. Hey there, guys. Darren Taylor of thebigmarketer.co.uk here, and my job is to teach you all about search engine marketing. If that’s up your street you should consider subscribing to my channel. Today, we are not talking about search engines. 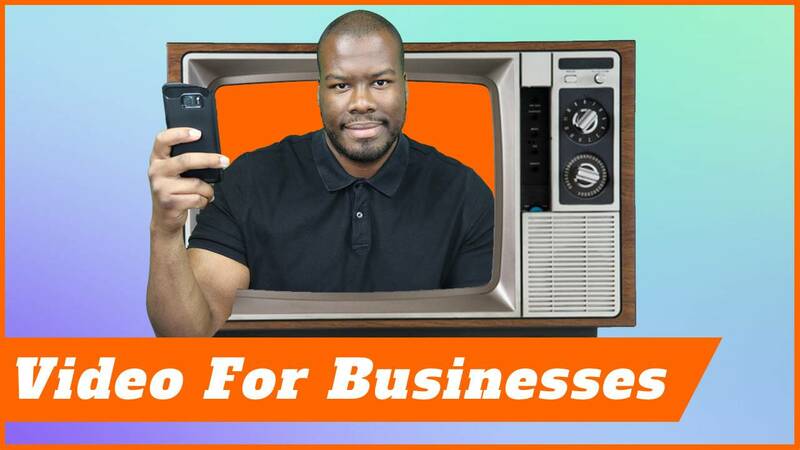 We’re talking about video marketing and why businesses are either afraid to do it or can’t get it quite right and don’t know how to execute on video for their business. Let’s look at the first thing in the list, which is how businesses are getting video wrong. Now, a lot of small businesses who I speak to will often say, “I get it. Video works. I love video. That’s why we have a video on our site.” Then I go over to their website and what do I see? I see one of those terrible, terrible promo videos where it’s literally just a guy talking in the background, with stock images going by, and the company logo, and that’s about it. It’s no personalization, no interaction, no atmosphere, no engagement. It is very, very bland. It’s a terrible, terrible way to do video but these videos are incredibly popular. Now, I don’t mean to criticize anybody who’s selling these types of videos to small businesses. Well, I guess I am really because at the end of the day, these videos don’t do anything for the user. They don’t give any more information in a nice format. They don’t provide any engaging material or any kind of content that’s useful. They’re absolutely pointless. If your business has one of these videos on its website, guess what? It doesn’t do anything for you. I can already hear you asking me, “Darren, what should we do instead?” Well, here’s where you can start. The first thing you need to do is understand that writing web copy is the same as creating video. What I mean by that is, you want to engage the user and make sure you speak to them and their needs, not necessarily just reel off the history of your company, with some stock images. It’s not going to work. Make sure you make a list of what you want to get across and convey to your audience, to make sure they’d be interested in doing business with you. This can include your working day to day, so they can see how good your work environment is. It could also include things like customer testimonials in terms of video testimonials. It can also include messages from key people within the business about why they’re passionate about what they want to do and how they want to help you. Highlight those USPs and make sure you get all those messages across when you use any kind of promotional video. You know the kind of video, the kind of one on your homepage that you want to promote when people get to your website. Video is the richest media format there is. You need to leverage it! In addition to that, if your product isn’t necessarily service-led, it might be a piece of software or product, you want to make sure you have a good explainer or demonstration video because that’s going to add real value to the user when they want to understand your product, especially if it’s a complex product. The second way businesses can utilize video is to use social media. Now obviously, for my videos, I’m using an SLR camera and I’m using quite a nice lighting kit. It might not be expensive. By the end of the day, I’m sitting in a makeshift studio in my spare room. Businesses don’t even need to do that. I’ve gone beyond that point already. What businesses actually need to do is just get started, just start recording content on their phone. Your phone in your pocket is powerful enough to get good quality video. I started this YouTube channel using just my Samsung Galaxy S7 device. I’m sure you could get started using a better device than that. Right now, take out your phone and tell your story. Tell the story of what’s going on in your business. Talk about the projects you’re working on. Talk about the interesting things you’ve come across. I noticed a lot of people on LinkedIn do this really, really well. They tell their story about their business. They go through what they want to achieve with their customers, give a bit of free advice away as well. All these things are going to really help you get better results on social media using the medium of video. Another way you can get across great video content for your business on social media isn’t just necessarily posting long-form video explaining how things work and what you’re doing and adding value. Even tiny, short videos on social media networks like Instagram can be very effective. For example, if you’re a restaurant, do a very quick video on a dish of food you’ve just made. Maybe 10 seconds, literally looking at the plate of food and conveying how delicious that food could be. If you’re a car servicer, you want might get a nice car into your garage and you want to show people, “I’m working with a really powerful supercar,” or something like that. Maybe just a quick shot of the engine interior or something like that, will be powerful enough to convey that. Use very short, micro content on social media using video. It can really help bring your business to life as well. I know of a takeaway shop in London that gets tons of engagement within the South London area simply by taking a video of them serving up tons and tons of bagels. Literally, they’re making bagels with chicken and sauces and stuff like that. They’re just making videos of it and then putting it out there on Instagram on Facebook and they’re getting loads of engagement and their brand is in the forefront of all South Londoners, whenever they’re hungry after midnight. It really does help and it really does make a difference and it can have a positive impact. Another reason a lot of businesses are worried about doing video is because they think that people aren’t going to be interested in what they have to say. It doesn’t matter what the niche is, there’s always going to be- I hate using this term but a ‘tribe’. There will always be people who are interested in what you’re talking about and what your interests are. There are people, there are thousands and thousands of people in the UK alone, who are standing at the end of train platforms, looking at the train carriage numbers going by because that’s their interest. That’s their tribe. You might think it’s boring. I might think it’s boring. In fact, I definitely think it’s boring but at the same time, they have people who are interested in it. There will be people interested in your business and your area of expertise no matter what it is. Put yourself out there and don’t be afraid to do so. There is no better way to do that than to use video content. Just getting started is absolutely key here. Don’t let the fear hold you back of creating video. Don’t be scared of getting on camera yourself. It’s not like TV these days where actors have to be good-looking, et cetera, et cetera. Anybody can get in front of a camera and it’s all about the words coming out of your mouth and your enthusiasm. That is it. Nothing else matters. What are you waiting for? What’s holding your business back from getting on camera for yourself or showing your business out there on camera as well? Let me know in the comments because I’ll be really interested to know, and I really want to help you get started with video. Thank you, guys, so much for watching this. By the way, if you liked it, please leave a like below and come back to me in the comments with anything you’ve got in terms of suggestions for future videos as well because I’ll be really interested to know that. More important than that, don’t forget to subscribe. Check out the other content on my channel and I’ll see you guys on my next video.